Thread: What 1x gearing is everyone running for cx racing? I'm on a 42 with a 11-32. I'm on a 40 with a 11-42. ^^^Nice. 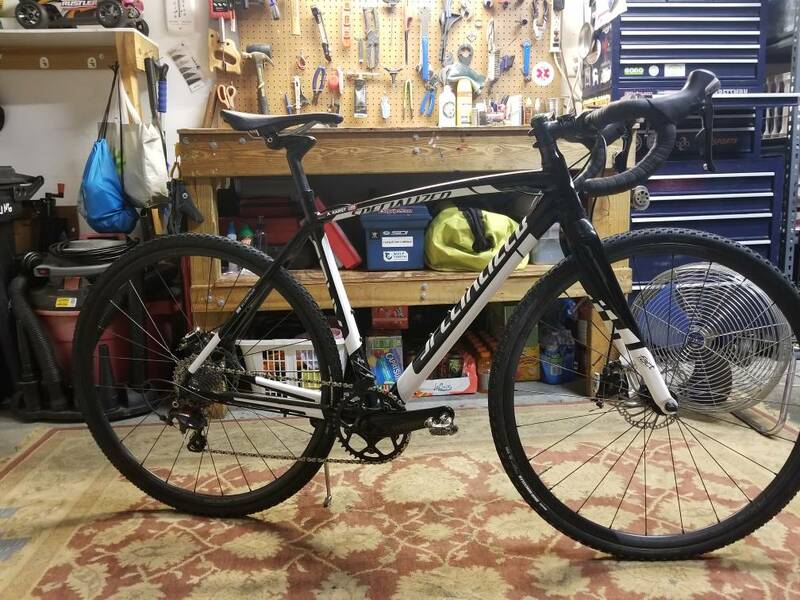 I run a 11-40 with the 42 when I convert my CruX to gravel mode. 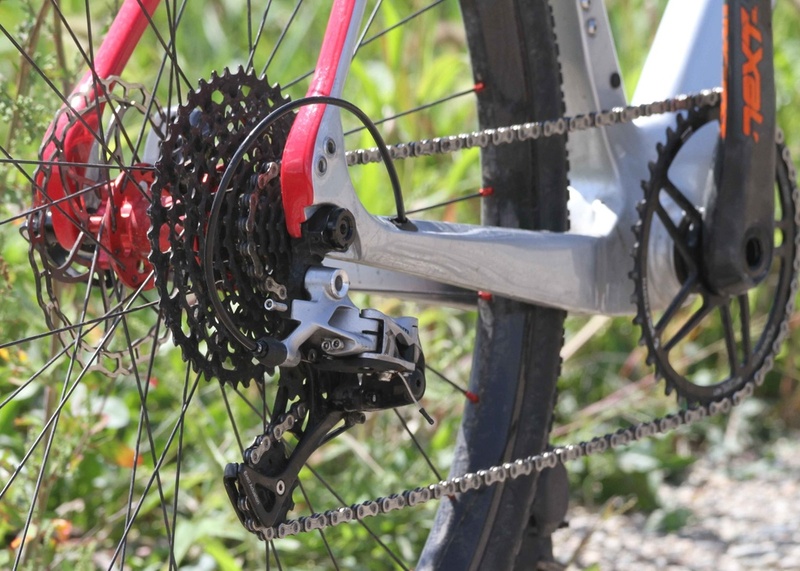 Question, do you ever have any issues with back-pedaling with that cassette and the chain jumping off the cassette to the outside (when you are going fast in your smaller cogs)? This happens to me from time to time due to the heft of the XT 11-40 and the inertia it generates. Basically, when I back-pedal at the speed (even just stop pedaling abruptly) the cassette continues to rotate a bit b/c it's so heavy/takes time to slow down and the chain slackens briefly. Thinking I just need a much lighter cassette! No issues with the 11-32. Never had any issues with the chain jumping off (knocking on wood). However, now that you mention it, I have noticed the cassette continuing to rotate when I backpedal. This is going to be my first cross season and have been using my bike on races such as the Belgian Waffle Ride. I'm actually trying to see if I can gain more top end speed while not losing my climbing gear because I find myself spinning out when trying to keep up downhill on the road. I've been staring at the gear calculators the past 2 days and it feels like I'm staring into an abyss. I'm running a 40t chainring and a11-32 cassette for cross, then switch out the 11-32 to an 11-40(and chain) for gravel. I'm on a 39x11-32 (mid-pack cat1/2 masters 45+). Our courses are generally pretty rough and/or muddy, - good to have a fairly low gear. I'm on a 40 chainring and 11-32 cassette. I've had the cassette keep moving when I stop pedaling, but it's usually due to drag in the freehub body, not just that the cassette is heavy. What kind of hub is it? 40 with an 11-32! I have a 42T chainring too, but rarely if ever do I feel a need to use it! I have a 2x but never shift out of the big ring during races so 46 x 11-28 for me. Seems fine around here, especially early in the season when things are dry and fast. 38 Oval CR, 11-28. CX Racing only. You must be pretty strong to use that. Just flat around here. Most of our cross courses don't have much in the way of hills. I race in an all ages B class and usually run a 36 oval (also have a 38 oval) and an 11-32 cassette. I see lots of guys with bigger gearing, but I usually finish ahead of them and I've never run out of top end. I do race at about 5000' of altitude and often have multiple hills. I pass a lot of guys on the climbs who are barely turning the pedals at walking speed because they don't have a low enough gear. If my carbon crank didn't have 130 spacing (38 is the smallest that will fit) I'd probably run a 36x11-32, on our typically rough or muddy courses I doubt I'd ever run out of top end. - I recently changed to an oval ring, the first couple of rides (and 1 race) I thought it was just marketing, but on the steepest hills climbing is noticeably easier, like at least 1 tooth smaller in front. I get to try 36x11-28; I just bought a used Blue carbon Norcross with that gearing. I'm going to try to stay with the 11-28, 28 should be low enough for racing, it's pretty close to as low as my 39x32. After tonight's race, I'm going to a 38 with a 11-32....better to have lower gearing in my experience.... never max the gearing out with a 42/11-32 but would love to spin a faster cadence on some of the climbs. 40t front x 11x32 rear for cx racing and cx season riding around/training. I put on a 11x36 cassette for road/gravel season. I was on a 42t front last year, always felt like I was using the same few large cogs on the rear in cx races. The 40 lets me use more of the cassette. Wouldn't mind trying a 38 for cx racing. And I might look at an 11x42 or something like that for the off season next year, mostly because then I could use a 42 or 44 on the front and get a bit bigger top gear for long road descents. A 42 11-40 works great for gravel grinding. Installed my 38t ring...much better lower end. I think I may just go 11-36 for gravel with this ring. Same low end as I had with a 42 11-40 just lose a little on the top that I don't use much. Much lighter overall setup this way. "Dang! You got shocks, pegs. Lucky! Wolf Tooth 34 x 10-42. 34 front is really nice when you're on the second of back to back cx races. 38 x 11-36 for road. 52? x 11-36 if I want to do another flat crit. After chain coming off thrice in two muddy races, got a k-edge chain guide. Last edited by Pegleg81; 12-12-2018 at 09:00 PM. 42T oval WolfTooth cinch chainring up front, SRAM XG-1195 10-42T cassette in the back, and SRAM Rival derailleur paired to SRAM Force levers and brakes. I don't recollect ever using the 42T cog in the rear over 1200 miles. Rival shifting isn't very crisp and I get some ghost shifting issues when it gets at all dirty. I am running 42 x 11-36 on my crux. Last edited by eplanajr; 02-08-2019 at 09:44 PM. 36 x 11-28. The low end is good for most racing and I like the tighter spacing to better ensure I can find the right gear. I've never had an issue with not enough high end (for racing...for gravel riding it'd be nice to have a little more top end). I've been running that combo for the last 3 seasons. Same opinion, plenty of low end, plenty of top end with tight spacing. 40 x 11-32 is a good overall setup. Last edited by j102; 03-10-2019 at 06:30 PM. Depends how strong you are and riding style, but generally speaking, 38-42 in front and a 11-32 out back is a solid combo. I personally like Oval chainrings and I think I'm currently on a 42....or it could be a 40, both work well. Top end is rarely the issue and I think undergearing if you can is actually a good strategy so you don't kill yourself. There are some fast single speed guys who are not THAT much slower that the top geared guys, just sayin. What are you 1x9 guys running for gearing? So what SS gearing are YOU running at the Lumberjack 100? Time for new Tires what is everyone Running?